I've eaten a lot of hummus in the last few years. And I truly mean a LOT. It's delicious, and filling, and healthy. And then I started hearing tales of hummus restaurants that serve it as a meal with lots of delicious stuff served on top. And then I saw a recipe that looked interesting from Simply Lebanese. And so I started looking around at other recipes. 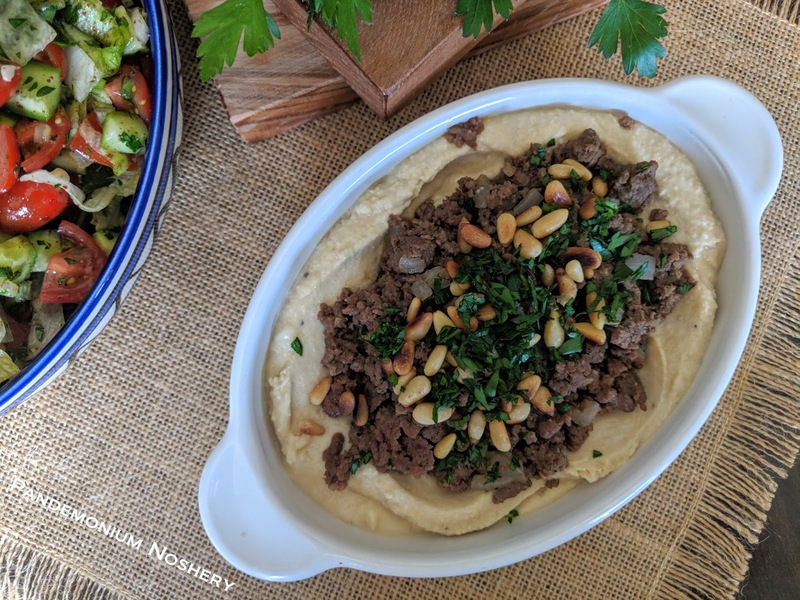 One thing I Was pleased to see is that hamburger is fairly common, I wasn't sure about the texture difference eating hummus with chunks of steak. And secondly it made it really easy. The spices I use are those found in Lebanese 7 spice with the addition of Aleppo pepper flakes, onion powder, and swapping cloves for allspice since I dislike cloves intensely. Look for Aleppo pepper in Halal and Middle Eastern markets. I love small ethnic markets, they are really fun to look through and find stuff I don't know how to use yet. And I like to support them whenever I can to help them stay around. If you can't find them at all Korean gochugaru is very similar or use extra paprika. Combine all of the spices, from salt to onion powder. In a large skillet start to brown the meat. Once the meat starts to cook slightly add the onion and seasoning mix. Continue cooking until the meat is cooked through. Spread the hummus on two plates. Divide the meat in half and use to top each plate. Top with toasted pine nuts and fresh parsley. Enjoy with pita bread or corn chips.